DISC Theory - What is DISC? Dealing with grief is never easy, not only around Memorial Day, but any time of the year people think fondly of the loved ones that they have lost. It is never easy to lose a loved one, and for some people this national day of mourning will bring up complicated feelings. Grief is understandably an uncomfortable topic for many people. In America, we do not have any nationwide public policies regarding paid leave for grieving employees. We also don’t have many universal traditions regarding expectations for behavior while grieving. Traditions for burial rituals vary from culture to culture and from religion to religion. For example, many Jewish traditions require a week of uninterrupted grieving in the form of sitting Shivah. Some Christian traditions involve a funeral ceremony held within a Church and overseen by a priest or minister followed by an underground burial. A number of Muslim traditions involve collective bathing of the deceased followed by wrapping the lost loved one in white cloth and an underground burial. Within these traditions, cremation is forbidden. But a number of Hindu burial rituals include a funeral pyre, and unlike in the States, the grieving parties wear white as opposed to black. With so many variations in cultural traditions, it is unsurprising that there are just as many variations in individual responses to the enormity of loss. The aforementioned burial traditions may give us some insight into how a community or religious group might behave during the heartbreak of the loss of a loved one. But how might grief manifest in an individual, and how might people with different personalities come to the aid of grieving friends and family members? Having an understanding of the grieving person’s personality might help the mourner and their loved ones find sympathy or empathy and figure out an appropriate approach to healing and helping them in their moment of need. Each of the four prominent personality styles may respond differently to grief. Each person’s response is likely to correlate with their stress patterns. These stress responses might align with their mask graphs. It is this piece of information that can assist us in understanding why a person’s response to grief manifests itself in a certain way and can help us to be sensitive and understanding in our approach when we attempt to ameliorate their pain. For someone whose stress response includes an elevated S, this person may become more cautious. They might seek security and stability when they might have been more willing to take risks in the past. This might mean that they attempt to keep their remaining loved ones even closer, seeking affirmation that they too will not be leaving. It might cause them to engage in actions that allow them to feel like they can guarantee a less tenuous future. They will seek security in an uncertain world. This might cause them to attempt to secure specific details, things they think they need in order to envision a more stable future. They might attempt to acquire things that are seen as permanent, such as buying a house or getting married or signing a contract, anything that implies a sense of permanence. Though the S Style personality in a non-stress pattern might be a little anxious about new acquisitions -- as they would fall under the category of “changes,” an otherwise undesirable moniker -- these changes are actually an attempt at ensuring that things don’t change. They are attempts to minimize uncertainty. This person might be willing to seek out a group therapy type of grief counseling, as they prefer feeling as though they are part of a team or community. They may have trouble opening up but will want to talk about their feelings if given a chance to a trustworthy audience. They will probably seek solace in their families and close friends. A person with an S stress response wouldn’t be the one to speak at the funeral itself, as they don’t want to be in the spotlight. They just want the comfort and solace of loved ones’ support. As one of their loved ones, you can provide that for them by reassuring them that you are there for them and that you won’t be leaving them, too. This will help to assuage their greatest fears because those fears truly came to fruition when their loved one passed away, and they need this reassurance. A person with an I stress response may have a different reaction to loss. The I stress pattern needs an audience for its feelings and so may be more likely to talk about how they feel. They might post about their lost loved one and subsequent grief on social media. They may want to be the eulogist at the funeral. Individual grief therapy may be a good fit for them because they will need an audience that can give them undivided attention. They may have a desire to vocalize and process their thoughts and feelings with someone who knows how to listen. The I style stress response may want to host a large celebration of the deceased person’s life. This is their way of being optimistic in light of tragedy. They may make jokes to deal with the pain or bring the subject of their deceased loved one up in conversation when it isn’t really relevant. They aren’t trying to be selfish, they just need to talk it out, and being a grieving person may in some cases put them in precisely the type of spotlight that they need to process this trauma. To help a person whose response to stress includes an elevated I pattern, you just need to listen. It’s so difficult to lose someone and not be able to talk about it for fear of making other people uncomfortable. It may make the loss even more real. You can help them by just letting them talk about what they need to talk about. A C style stress pattern may have a number of different potential responses to grief. This person is meticulous, so they may need to be in control of the funeral arrangements, but they may not want to be if they do not feel like they can honor this person by doing this correctly. They may show that they are upset by being particular about certain things, such as ensuring that the font size on the gravestone is consistent so that the stone doesn’t look sloppy. Or they might be a little too adamant about the fact that the deceased’s favorite flower was a Poppy, not a Daisy, so only Poppies should be included in the ceremony. They show that they care by paying attention to the little things and will probably be upset if the details do not align with their thorough understanding of the person they loved. This person is task-oriented, and so they will want to do something actionable with their grief. They probably don’t enjoy talking about their feelings, so it is best not to force them out of their comfort zone. They may need to control the things around them to feel like the world is back in order. And that’s okay -- allow them to be particular and detail-oriented. Ensuring that the ceremony is precisely attuned to their loved one’s preferences is their way of showing love. Give them the space to talk about their feelings but don’t pressure them or expect them to talk. They want to do something to fix it, but nothing can be done. Grief is a problem whose solution cannot be systematically determined, and it is immensely frustrating to a person with a C style stress response. To deal with this, they might become very controlling about their environment, making sure that everything is in order and becoming very upset when another person doesn’t abide by the systems set in place. It isn’t that they’re trying to be cruel, it is just that abiding by systems and keeping spaces clean and orderly helps them to feel a sense that they can control their environment during a time when everything feels out of control. Try to do something with them to help them feel like they are doing something with this feeling. Take a walk with them, give them space if they need it, and try to understand that everyone grieves in their own way. For someone whose stress response includes an elevated D, they may seek control in a different way than someone who's stress response includes an elevated C. They might make decisions based on a whim. They will probably take control of the funeral planning and make all the arrangements to ensure that they are not being taken advantage of in their vulnerable state. They might decide to tell others what to do, such as demand that certain people come to the funeral or demand that people at work abide by their decisions without compromising or negotiating. Much like the other stress responses, this is the D’s attempt at controlling their environment when their emotions are difficult to control. This personality type might be prone to doing things like buying new objects to portray a sense of status, since their status as a grieving person may cause them to feel weak or out of control. This person may also have additional struggles when it comes to speaking about their grief. They are task-oriented over people-oriented, so they will want to do something active with their grief, and grief is not a problem that has a tangible solution. Talk therapy might be unappealing to this type of personality. They might be inclined to repress some of their feelings because grieving openly could be perceived as weakness. Try to give them some privacy and try to have some patience with them when they make decisions rooted in grief that you think are unwise. It may also be unwise to attempt to force them to talk about their feelings, but just like every other person in the world, they will still need to have people in their lives that they know will support them. It’s okay for them to express their feelings; it isn’t a sign of weakness but rather courageous, but it may take them some time to get there. Though this article focuses on the type of grief a person feels when a loved one has passed away, everyone goes through some form of grief at some point in their lives. 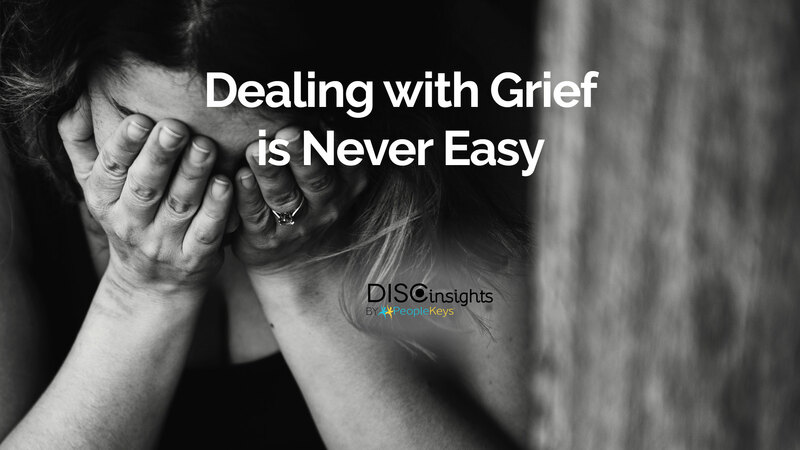 There are many different types of grief, and the magnitude of each loss varies depending on the person, but it can certainly be said that grief is a universal human feeling. Maybe the grief a person feels comes from the death of a loved one or a cherished pet. Maybe a person’s grief revolves around the dissolution of a relationship or the loss of possibility, such as finding out you didn’t get a promotion or cannot have biological children. Maybe someone is grieving the loss of their community when they moved to a new town. There are many different types of grief, but being able to anticipate and understand your response to grief and the responses of others will help everyone to be more sympathetic and empathetic with themselves and others. It will also help you to identify the grief patterns and needs of the people around you so that you can support them in the way they need to be supported. Grief is hard, but it becomes easier when we are in it together.